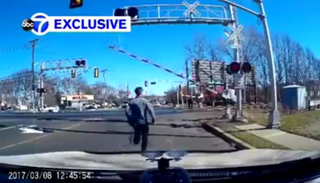 After spotting an elderly woman having a hard time crossing the tracks with an oncoming train, a New Jersey man hops out of his car and pulls her to safety with mere seconds to spare. According to ABC7 News, good samaritan John Mango from Saddle Brook, New Jersey was sitting in his car at the train tracks when he spotted an elderly woman walking slowly with a cane. She approached the tracks with the barriers down and the warning lights on. Mango noticed that she started having difficulty and seemed to have gotten stuck on the tracks. That’s when Mango leapt from his car and pulled the woman to safety, just in the nick of time before the NJ Transit line came barreling down the tracks. 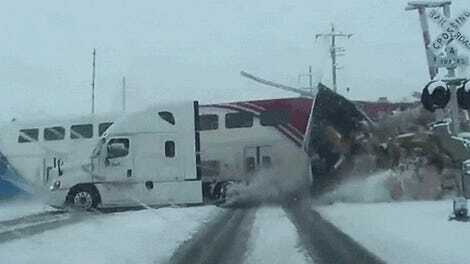 It is difficult to see from the video below, but the train missed them by inches. Despite not wanting any notoriety from the rescue, police called Mango’s work afterward to thank him for what he did.